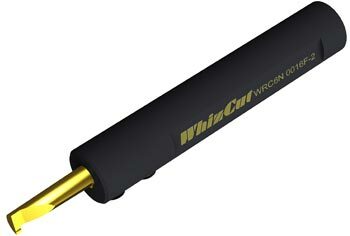 WhizCut is the leading manufacturer of cutting tools specially developed for CNC Swiss type automatics. WhizCut offers a complete range of carbide inserts for turning, boring bars, thread mills and micro drills. With this precision tooling WhizCut will help You improve productivity and reduce interruptions in production in your Swiss lathe. WhizCut has a set of tool holders and the most extensive line of inserts for external turning in Swiss automatics. 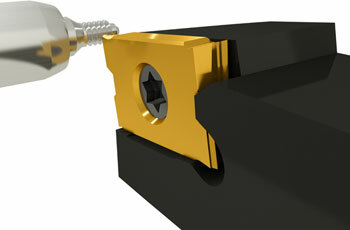 The WhizFix tool holder system for external turning in swiss automatics uses a bent pin and a nut to index the insert. Indexing an insert is easy, accurate and quick. You can index or change the insert while the tool holder is in the machine even if there only is access from the back side of the tool holder. Most WhizCut toolholders are also available in a WhizHip version. 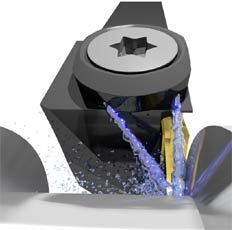 The WhizHip tool holders have high pressure coolant through the toolhoolder. The WhizThread tooling system is a full range of threading tools for Swiss automatics. 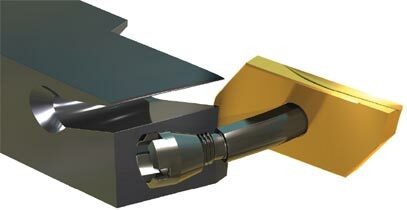 The threading inserts have four fully ground cutting edges and are available in wide range of geometries. The threading tool holders are designed to give the threading inserts maximum stability. All this together results in a treading tool system for CNC Swiss screw machines that outperforms any other tooling setup. The WhizThread tool holders are available with the world renowned WhizFix tool holder system for reduced interruptions in production in CNC Swiss automatics. The WhizIn tool holder for internal turning in Swiss automatics has the carbide boring bar mounted at an angle to achieve greater precision. By mounting the carbide boring bar at an angle we grind away less from the base of the insert which makes the boring bar more stable. Other benefits are less grinding time and grinding stress and that the coolant may go through the tool holder and spray directly on to the cutting zone. The WhizThrill deburring solid carbide thread mills take thread milling to the next level. WhizThrill will change the way thread mills are used today. WhizThrill thread mills are produced with the best carbide and coating combination to be in forefront of technology both when it comes to tool design and material. WhizCut also offers a wide range of micro thread mills with extra tool strength. WhizDrill is a range of carbide micro drills developed for the smallest and most demanding drill operations. With our unique and very effective production of these very small carbide drills we are able to produce drills according to your requests. WhizCut manufactured precision Swiss tooling is specially suited for CNC Swiss automatic lathes such as Star, Citizen, Tsugami, Hanwha, Gildemeister and Tornos.